The dialog below is from an actual Dharma teaching and one we recommend using as a “template” on how to conduct your own discussions regarding the eating of animals as it relates to the practice of Dharma. One Spirit Rock teacher suggests that our inquiry tonight is “an invitation to explore how our eating habits express or fail to express our deepest values of compassion and reverence for life. This is a safe place to explore that without judgment.” Let’s break into groups of twos (diads). In a minute, I will hand out colored photographs of gourmet meals of meat, chicken, and fish. I invite everyone to look carefully at the photographs. And, as you do, be mindful of your experiences in the mind and body. Is it pleasant, unpleasant, or neutral? Is there wanting or aversion? Curiosity? In the body, are you experiencing tightness, tingling, salivation? There are no right or wrong answers. (After several minutes I invited one person in each pair to take several minutes and share with their partner their experiences with the photographs.) I will ring the bell and the listener will become the speaker. Please practice mindful speech and mindful listening. At first, I experienced pleasure and wanting – hunger for the appetizing food. Then I realized the food came from what was once a live animal. Guilt arose. I formed the intention to try to eat without supporting farm animal suffering. I also experienced pleasant sensations and wanting mind. Then I realized that the photograph was not of a cooked chicken, but a cooked duck. I love ducks and wouldn’t eat them. I don’t feel a close connection with chickens. I was immediately aware of aversion to the suffering of the farm animal that wound up on the plate in the photo. I have moved significantly toward a cruelty-free diet. I am also aware of the tremendously negative impact factory farms have on our environment. I saw all that in the photo. I am also on the path toward a cruelty-free diet, but I’m not there yet. I saw different levels of pleasant and unpleasant, and wanting and aversion as I went back and forth between the food on my plate and awareness of its source. When I saw the dead animal on the plate in the photo I experienced anger. Why would anyone do this to an animal when we don’t need to eat them? I experienced a lot of aversion. I was very aware of the suffering that produced the food. I struggle with the suffering I support with my diet as I move toward changing my diet. What was the life of the animal like? What was the death of the animal like? Did the animal live to its full life expectancy? After several minutes, who wants to share their experiences? Question from student: I am not vegetarian. I know that animals don’t live anywhere near their full lives before they’re slaughtered. But, why are we talking about this? Response by the teacher: The invitation here is to explore how our eating habits express or fail to express our deepest values of compassion and reverence for life. I’ve seen the unimaginable suffering experienced by farm animals as they are raised in factory farms and slaughtered. Jonathan Safran Foer, a best-selling novelist, in his nationally acclaimed book, “Eating Animals,” recounts his experiences in trying to see for himself what happens on a factory farm and in a slaughterhouse. He encountered barbed wire fences, padlocks, attack dogs, and sophisticated alarm systems, intending to keep what goes on inside from the public eye. Under cover of darkness, in the early morning hours, he managed to get inside and tell the story of torture and cruelty. I strongly suggest that you read it. My role here is to be the voice of the animals. There are loads of videos shot by undercover animal rights activists and countless books and articles based on eyewitness accounts. You might check out the videos, “Glass Walls” narrated by Paul McCartney or “Meet Your Meat” narrated by Alec Baldwin at www.meat.org. Question from student: I can only imagine the pain and fear that the animals experience. There is a difference of opinion here. 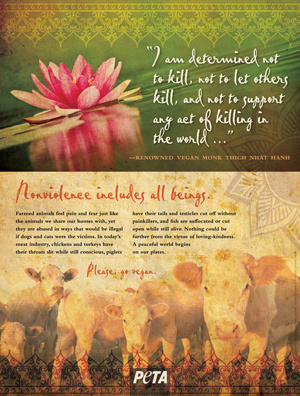 Some in the Dharma community have the belief that our ethical responsibility ends with avoiding actually killing an animal for food. If we pay someone else to do it, such as when we buy chicken at the store or at a restaurant, that’s okay. For those with that opinion there is no need to know about the life and death of the chicken. The Buddha made it clear that farmed animals, indeed all animals, are sentient beings. As such, they are entitled to be free from our harming them. In my opinion, any ethical belief system must look, not only at one’s own actions, but, also to those sentient beings that suffer because of one’s actions. We are actively involved in that suffering when we buy dead animals to eat. Question from student: I have an ethical dilemma. I don’t want my eating to cause suffering, but I cook for meat eaters in my family. Response by teacher: You can adapt many recipes for vegetarians, by adding or omitting ingredients. Some good vegan/vegetarian websites are: www.goveg.com, www.vegcooking.com, and www.vegnews.com. Question from student: Why don’t we talk about other aspects of wise action? Response by teacher: We will, but there is no more time tonight. Question from student: I found the presentation illuminating. But, I still intend to eat meat because I like it and it nourishes me. I am interested in eating animals that are not tortured. Question from student: Didn’t the Buddha eat morsels of meat that were placed in his alms bowl? Response by teacher: Yes, he did. But he told his monks not to eat an animal that is killed for you. When we buy meat, chicken, or fish at the store or restaurant, the animal has been killed for us and another one will be killed to replace the one you ordered. Question from student: It’s hard to change my diet all at once. Response by teacher: You might start somewhere. Try a vegan/vegetarian breakfast or lunch every day. Try eating a vegan/vegetarian diet for one or two or three days a week. When friends and family visit for dinner, prepare a vegan/vegetarian meal. It is better to begin taking animal products out of your diet incrementally than to not begin at all. If you take chicken out of your diet you will be extending compassion to 35 chickens a year. This is the U.S. national average of chickens consumed per capita each year. As a practice assignment, be mindful of what you eat and reflect on the animal suffering supported by your choices and, on the other hand, the animal suffering spared by your choices. We hope you find this dialog helpful in facilitating discussions with your Sangha regarding vegan and vegetarian choices.